Birds have long been viewed as the archetypal featherbrains--beautiful but dumb. 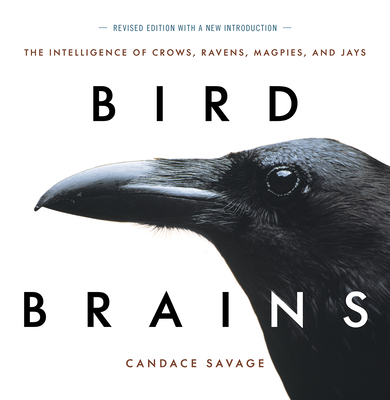 But according to naturalist Candace Savage, "bird brain," as a pejorative expression, should be rendered obsolete by new research on the family of corvids: crows and their close relations. The ancients who regarded these remarkable birds as oracles, bringers of wisdom, or agents of vengeance were on the right track, for corvids appear to have powers of abstraction, memory, and creativity that put them on a par with many mammals, even higher primates. Bird Brains presents these bright, brassy, and surprisingly colorful birds in a remarkable collection of full-color, close-up photographs by some two dozen of the world's best wildlife photographers. Savage's lively, authoritative text describes the life and behavior of sixteen representative corvid species that inhabit North America and Europe. Drawing on recent research, she describes birds that recognize each other as individuals, call one another by "name," remember and relocate thousands of hidden food caches, engage in true teamwork and purposeful play, and generally exhibit an extraordinary degree of sophistication.